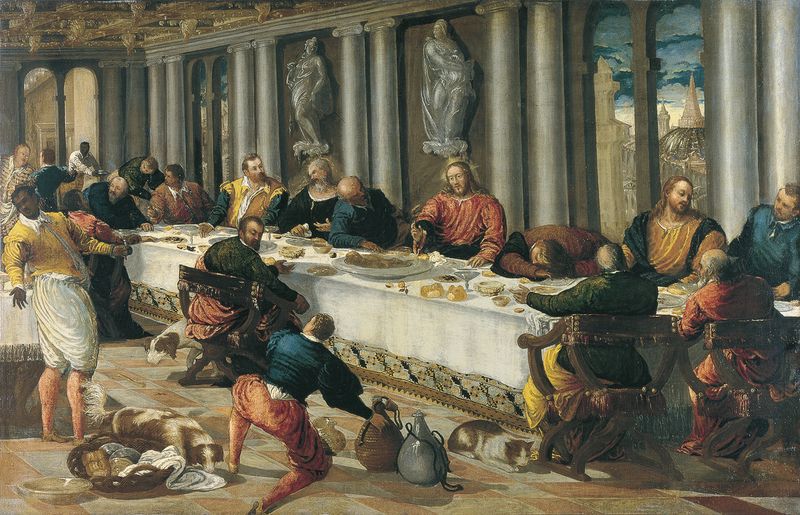 The Last Supper entered the Collection in 1934 from a private Venetian collection. One year later it was the subject of a brief report by Gronau, possibly commissioned by Baron Heinrich Thyssen- Bornemisza. The painting has been attributed to El Greco since it entered the Collection and was described as such from the 1937 catalogue by Rudolf Heinemann to Gertrude Borghero’s text of 1986. August L. Mayer examined it in 1945 and also considered it to be by El Greco, an opinion shared five years later by José Camón Aznar who dated it to around 1567. In his monograph on El Greco, however, Wethey included it in the chapter on works by the artist’s school, copies and incorrect attributions. He attributed it to the Venetian School around 1590 and detected “a combined influence of Veronese and Tintoretto”. This opinion was shared in the 1992 catalogue published on the arrival of the Thyssen-Bornemisza Collection in Spain. In this publication it was, however, dated to around 1570. Authors who associated this work with El Greco considered it to be from his Italian period, when the artist assimilated the western style of painting. Having left Crete, El Greco settled in Venice in 1567, leaving there in the mid-1570s to move to Rome, which was his last period in Italy, and from there to Spain in 1577. There are many gaps in our knowledge regarding El Greco’s ten years in Italy although new works from this phase have continued to be added to his oeuvre over the past decades. The Last Supper was not a subject frequently painted by El Greco, although there is a work by the artist on this theme in the Pinacoteca Nazionale, Bologna, dated to around 1567–70, which corresponds to his Italian period. The approach to the subject has little in common with the present canvas. For the Bologna work El Greco looked to models by Tintoretto and arranged the subject around a table with the Apostles on all four sides and Christ facing the viewer, located in a simple interior with a checkerboard floor. In the present work, however, the artist has created a pronounced diagonal with the table, which runs across the room from one side to another, leading the eye to the end of the room. Also in the centre, Christ begins to bless the Apostles who are seated in Savonarola chairs at his side and at the ends of the table. The room is decorated with striking architectural features that create the spatial setting such as Ionic columns and sculptures while through the windows we see a city view with rooftops and buildings. As previous authors have noted, the painting recalls works by Tintoretto with regard to the composition, and by Veronese in the wealth of anecdotal detail surrounding the main episode.